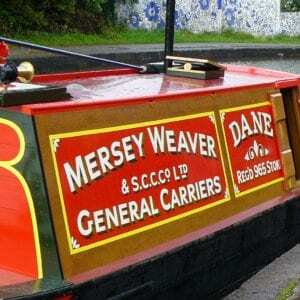 The Narrowboat ‘Dane’ is one of the oldest remaining wooden hulled motor narrowboats still in active use on our inland waterways. Many of these craft had hard and long working lives of fifty years plus and Dane was no exception. When her current owner encountered her, she was sat on the bottom of the canal and an extensive restoration followed. The ‘back cabins’ of these craft were where the entire family lived. They were usually around 6ft x 10xt and consisted of little more than a cupboard, a table that became a bed and a ‘stove’. The stoves or ranges in these cabins have almost always disappeared or rotten away in the days when the canals because derelict and boats were left to languish. Amazingly though Dane’s stove was still present and to date is the only original back cabin stove from the inland waterways that I know of. It is of no surprise however that it was in a truly terribly state as you can see from the pictures. The top plate castings were so thin you could almost see through them and many of the parts were either badly damaged or missing completely. True back cabin stoves differ from generic ranges that have been marinized. The differences are subtle but prove an interesting and significant demand in the market during the early 20th century. Wether or not such embellishments as brass fiddle rails were supplied at the foundry, by the carrying company or by the boatmen themselves is unclear but they were never without customisation. Dane’s example was manufactured Dobbie Forbes Ltd at their Larbert foundry, Larbert, Stirlingshire. No original images or literature survive for this rare little stove so the process of piecing it back together and making accurate patterns was slow but rewarding. We were able to retain the front plate, two of the three doors, hinges, banjo latch, base plate, grate carrier, back and side plates, fiddle rail and half the smoke box. Castings that required renewal were the top plate inc inserts and hot plates, half the smoke box, the firebox and the grate. The fiddle rail and standards are particularly splendid, and patterns have been taken from the originals in order to be able to reproduce these again in the future. As you can see the stove is back in place and earning its keep.